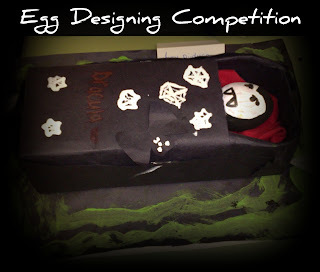 At school each year my kids enter the 'Egg Designing Competition'. This is always held just before the kids break up before Easter. The photograph above was the design that my son made, 'Dracula'. The children have to design their eggs and props at school, not at home! Apparently this is to stop the children having help from their parents. The photograph below is of the entry my 9 year old daughter made at school, these are chicks in a basket. Unfortunately, neither of them won the competition. There were some great entries and to be honest I think it must be so hard for the teachers to choose a winner. 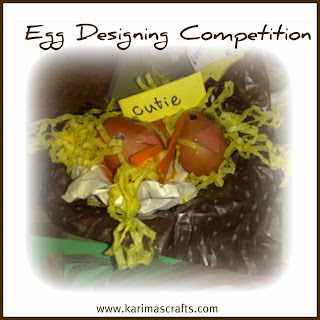 I boiled quite a few eggs, so that the kids could have a test run in the house the day before the competition, so they could see if their design would work. This was because last year things didn't work out well and paint was running all over. This year they decided to use marker pens instead!